» Possible timelines for martian agriculture? Possible timelines for martian agriculture? I alluded to this in a post in the "Trees" thread, so here it is. There've been lot of ideas bounced around by members of this forum, and although many have merit, most will not see implementation for a while after First Landing occurs. The discussion of plant crops, poultry, and other livestock including fishes, have been myriad. What is required is some degree of rationalization through ordering; in other words--what comes first, and what will come later. What will "come first," will be of necessity, structures: habitation with adequate shelter from GCR and Solar flares, then followed by greenhouses for development of a somewhat self-supporting "colony." (I somehow don't see real "colonization" occurring within the first 25 years--maybe even the first 100 years, contrary to Elon's magnificent view of things!). What I see will be an experimental colony/research station, one that will take on the aspect of a colony but will probably be populated by scientists there for maybe up to 2 or 3 Hohmann transfer windows. That will necessitate some degree of self-sufficiency development, since feeding the population will become onerous as well as expensive. So...taking things in the order I postulated: Habitats. Somehow, I don't think we'll be living in Tuna Cans for very long (indeed, probably never, based on NASA's scheme of things; that's just Zubrin's Mars Direct-Mars Semi-Direct scheme proposed by Zubrin and Baker.). In order to build "proper" long term habitation structures, we'll definitely need heavy equipment, starting with a "Bobcat" like unit. In fact, more than one should be provided if there are to be more than a handful of astronaut personnel. These skid-steer loaders are available with loads of useful accessories in addition to the bucket-type front loader; in no particular order, an auger for drilling holes, a forklift for unloading subsequent cargo ships, and a ditcher attachment for laying underground pipes and wires. Getting sufficient and safe shelter with adequate regolith overburden is Item # 1. This means the first agricultural experimentation will be relatively small scale, and done in raised bed, inflatable greenhouses. Before someone here pipes up with the idea of using the projected rovers with an afterthought frontloader, I'll rain on that parade from personal experience. The type of stresses placed on the vehicle would probably wreck it in a day--er--Sol, if not less. We'll need dedicated equipment that is suitably designed for the tasks at hand. The job of the Rovers is to transport humans. The job of the frontloaders is for construction, and the 2 cannot be combined. If we manage to F.U. the Rover in a Sol or two--there goes the mission science, as well as the construction of habitats. So--how large an inflatable and raised bed greenhouse should be considered? How will it be accessed? How will it be heated and watered? These are all questions that many on this forum could answer. We've already beaten the topic of WHAT should/could be grown to death; all that remains is HOW? That, and how big? One of the main issues of what should be returned to Earth: I would strongly argue for bringing back major quantities of regolith so the leading agricultural schools can have a go at making it arable. The research on crops could be done on an accelerated basis between Hohmann transfer windows, and the appropriate seeds and necessary chemicals could be launched on a cargo mission prior to or concurrent with the second crew manned flights. The schools could even rake in some cash to fund the projects by marketing "Vegetables grown in Martian soil!" Results of the first manned mission will dictate what problems exist, and by the second mission, we'll have a better handle on what can and cannot be accomplished using the primitive inflatable greenhouse. I would also argue for selecting the first crew from those who would make a serious commitment to remain for another transfer window opportunity, which is another reason I've argued for more than a 4 person first crew. I regard a 7 as an absolute minimum, with either 3 or 4 remaining for an additional 500 days. We bring 7, and return 3 or 4 each return transfer opportunity. For construction, base maintenance, and original research, we need a permanent base of 20 to 30 pioneers. This will be--in a microcosm--a very HARD way of life, at least until we get true agriculture with animals and larger greenhouses up and running. It will also be the most EXCITING endeavor taken on by mankind. Re: Possible timelines for martian agriculture? what comes first, and what will come later. The idea of an inflated greenhouse comes from "Case for Mars" conferences that occurred before founding of the Mars Society. In fact, Zubrin himself said he started with the 3rd conference. The point of an inflatable is to reduce launch mass from Earth. It was never intended to last long. This is for science missions, first human exploration missions, and initial settlement. They aren't intended for long term settlement. I have suggested the first settlers bring an inflatable greenhouse to produce first food, but any greenhouse made from in-situ resource will be made of something hard and more durable. For one thing, making a fancy polymer film that can endure conditions on Mars requires heavy industry of Earth. Don't expect a Mars settlement to even be able to make it. An easy to make transparent material is glass. Yes, simple normal glass. I've said the first greenhouse built of in-situ resources will have glass windows. PCTFE is far more durable than other polymer films. I do expect it to last longer. We've discussed applying fibreglass gauze for reinforcement, two layers with a gap filled with argon gas, and spectrally selective coating for UV protection and IR control for temperature. It will also have hold-down straps for stability, to squish it for maximum usable floor area, and each "pane" of film only has to endure tensile forces from one strap to the next. Make straps of webbing made from the same aramid fibre as parachute cords used by Curiosity rover. Although I expect this inflated greenhouse to be far more durable, and do expect it to last multiple missions, I still only expect it to last a single-digit number of years. Maybe 26 years if you're very lucky. Mars and Earth align once every 26 months, so 12 missions equal 26 years. Somehow, I don't think we'll be living in Tuna Cans for very long (indeed, probably never, based on NASA's scheme of things; that's just Zubrin's Mars Direct-Mars Semi-Direct scheme proposed by Zubrin and Baker.). Zubrin and Baker and all the engineers at Martin-Marietta were asked by management to come up with a plan to fulfill then President Bush Sr's request to send a human mission to Mars. Something practical, not the monstrosity of NASA's 90-Day Report that Congress already rejected. Before 1989, NASA had planned to use Apollo hardware. NASA intended 4 astronauts because that's how many could fit in an Apollo Command Module. After you replace the Avcoat heat shield with PICA so it could survive reentry from Mars, and after you move food and life support supplies to a separate deep space habitat. According to Zubrin's book, Baker came up with the Ares launch vehicle. Zubrin suggested maximizing living space by expanding the habitat to the same width as the core stage. Designs from 1965 would use a deep space habitat designed for zero-G, completely useless for Mars surface. It looked a lot like Skylab, and just as big. Zubrin's idea was a single habitat used for transit and the surface. It was a lot more practical. Zubrin/Baker design for the return vehicle still used a capsule the size of the Apollo CM. Current designs proposed by Boeing look like the 1965 monstrosity, and NASA appears ready to support that. 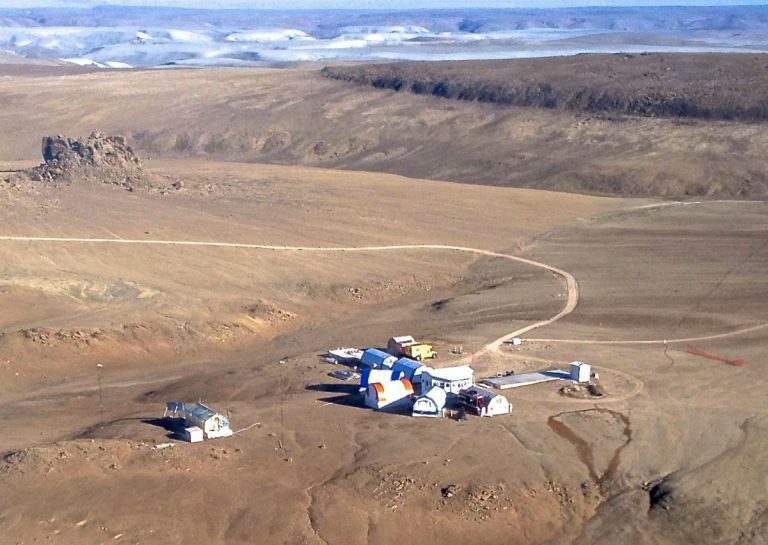 Some people at NASA think you can't survive in isolation unless you have an entire village, at least as many individuals as McMurdo on Antarctica. That houses 1,258 in summer, 250 individuals in winter. Anyone who thinks that's minimum just doesn't have the "Right Stuff". greenhouse ... How will it be accessed? How will it be heated and watered? ... We've already beaten the topic of WHAT should/could be grown to death; all that remains is HOW? That, and how big? I tried to calculate greenhouse area in Crops. I also pointed out some crops thrive in shade, some require full sun. I proposed a greenhouse with mirrors for those crops that require full sun. The reason is Mars receives 43% as much sunlight as Earth based on distance from the Sun. It doesn't have clouds or an ozone layer, but we will have to filter sunlight with spectrally selective window coatings to do the same job as the ozone layer. This means grains will require mirrors, vegetables do not. My proposed design is a long-narrow greenhouse aligned perfectly east-west, with flat mirrors on both sides, full height from ground to roof, angled 45° to reflect overhead light into sides. Greenhouse width exactly double height so total illumination will be exactly double Mars surface ambient. That will roughly equal Earth. This design means mirrors do not track the Sun; instead light at dawn reflects slightly westward but still within the greenhouse, at dusk the sun sets in the west so light will reflect eastward but again still within the greenhouse. Mirrors will have to track with seasons, but that means adjusting by 1° every 14 Mars solar days (sols), so every other week. Access directly connected to living space. A science mission should have a polymer film tunnel from the tuna-can hab to the inflated greenhouse. A permanent settlement will have greenhouses directly connected. Each greenhouse should have an airlock, or at least an air-tight door. It's unlikely a meteorite large enough to break a glass window will hit, but is possible. If it happens, you want to contain pressure loss to just one greenhouse. I've argued for more than a 4 person first crew. I regard a 7 as an absolute minimum, with either 3 or 4 remaining for an additional 500 days. We bring 7, and return 3 or 4 each return transfer opportunity. For construction, base maintenance, and original research, we need a permanent base of 20 to 30 pioneers. This will be--in a microcosm--a very HARD way of life, at least until we get true agriculture with animals and larger greenhouses up and running. It will also be the most EXCITING endeavor taken on by mankind. That sounds good for permanent base construction. However, we need to get started. The first mission must be small. Keep it small to keep cost down, and to limit risk. Apollo landed 2 on the Moon. Current plans will land all 4. I still argue for 4 crew on the first exploration/science mission. Mars Homestead phase 1 proposed a permanent base would start with 12 crew, arrive in tuna-can habs but as soon as possible build a much larger permanent base for themselves. Then double the base to accommodate 24 crew. Then accumulate construction material to build a separate but near-by base that would start with 100 settlers, but could expand to thousands. 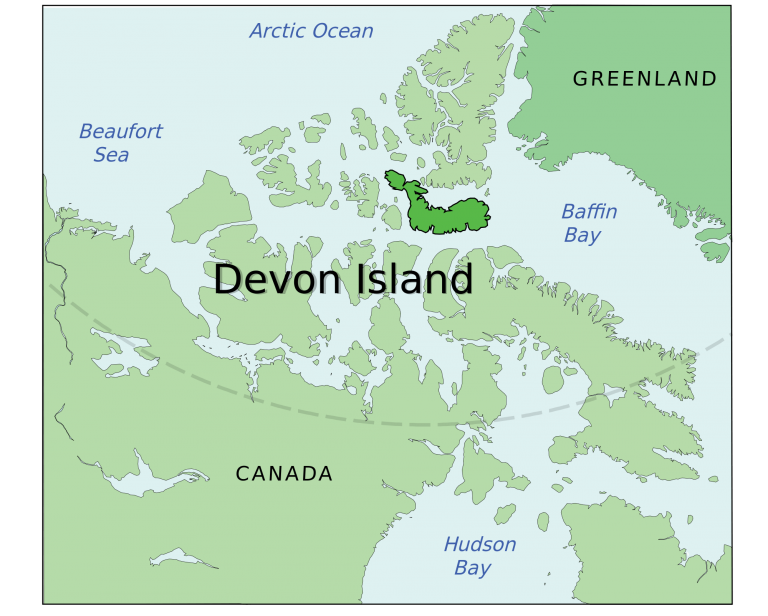 The first 100 would expand their base to accommodate 1,000 settlers. My proposed design is a long-narrow greenhouse aligned perfectly east-west, with flat mirrors on both sides, full height from ground to roof, angled 45° to reflect overhead light into sides. This is a really good idea. The mirrors add very little to the mass of the greenhouse but greatly increase yield, and also mean much more heat flowing into the greenhouse during the day, so it should make keeping a greenhouse warm easier. This design suggests a greenhouse that is cylindrical or close to cylindircal, which I like as well. Before we can make greenhouses with in situ resources, it is going to be difficult (though not impossible) to grow food using less mass from Earth than the mass of the food itself. If we bring over dry food and rehydrate it on Mars, we can probably get away with bringing about 300 kg/person/year. Let's also assume that it takes 100 m2 of crop area to grow food for one person, and a five year lifetime for a greenhouse. Then each m2 of crop area must be enclosed with only 15 kg of mass from Earth. If we assume a cylindrical greenhouse and ignore the ends, then we need pi m2 of greenhouse wall area per m2 of crop area, so we will have to get by with less than 5 kg/m2 of wall area. That's as much as a 2 mm thick sheet of glass or a 2.5mm sheet of PCTFE. So the walls of any greenhouse made on Earth to be transported to Mars must be thin. If we have thin walls, then we must also have low pressure forces since most suitable clear materials do not have high tensile strengths. Pressure forces are proportional to the radius of curvature of the greenhouse, so having a small diameter greenhouse allows the walls to be thinner. But having a smaller diameter greenhouse also limits the maximum size of plants and will have less thermal intertia to deal with nighttime cooling, so there is a tradeoff. My guess is that a good size would be just large enough for a person to walk around in. There's no reason the greenhouses couldn't be very long though. On heating, I think we have to find a way to use almost entirely solar heating. Near the equator on Mars, solar irradiance is around 3 kWh/m2/day, with mirrors, that can be brought up to 5 kWh/m2/day. There's no way we can provide anywhere near that amount of heat energy from photovoltaic or nuclear energy, so we'll just have to find a way to minimize heat losses. I'm not sure whether conduction/convection or radiation is the primary concern. 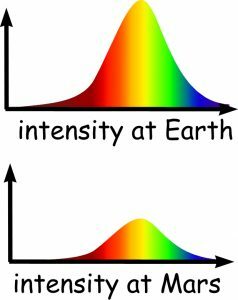 Radiation can be limited by using materials that do not transmit long wavelength infrared in the range emitted by objects at around 290K, and by putting a reflective cover on the greenhouse at night. This cover could be provided by folding the mirrors mentioned by RobertDyck over the greenhouse at night, but that would require a mechanized system or a daily EVA to do so. Conduction can be limited by using multiple greenhouse layers and by covering the greenhouse at night with a material with very low heat conductance like aerogel. The optimum size of a team seems to be around seven. This allows for a good spread of expertise and experience and is not unwieldy for the team leader (Base Commander). It allows for two expeditionary pairs at one time so that injured personnel may be recovered. If recovery is not possible, loss of an expeditionary pair would not jeopardise the overall mission. Landings should be split if possible so that some of the mission may be salvaged even if a descent goes wrong. I have an alternate vertical-cylinder geometry referenced in the thread "Trees". It might be a whole lot more robust, and perhaps easier to build, than plastic cylinders laying on their sides. Almost anything is better than vulnerable membrane balloons. I am a strong believer in Murpy's Law, and Murphy was an optimist! In order to accommodate ANY realistic form of agriculture, we're going to need a source of motive power and lifting/digging capacity. In an earlier thread or threads, we discussed having a skid-steer/front loader type vehicle in one of the early cargo loads to Mars. Virtually every machinery company builds these but have somehow all captured the name of "Bobcat." I for one, am strongly in favor of the hillside structure proposed by Robert, which if properly aligned w/r the sun track, allows maximum solar gain and illumination for the growing crops. As a secondary feature it can be built high enough to allow trees to flourish inside. I also support the rigid structure as mentioned by GW, since protection from micrometeorites is essential, and polycarbonate plastic can certainly provide that. The third consideration is weight of structure versus having an integral floor to hold it down on the surface instead of being levitated away by internal pressures. To SpaceNut: maybe we need to have a new thread here--one which attempts to unify all these concepts that growing trees has elicited? I may start something a bit later after completing the proposed organization mentally. skid-steer/front loader type vehicle ... Virtually every machinery company builds these but have somehow all captured the name of "Bobcat." 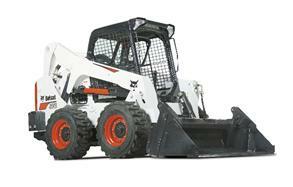 Then another company built a small skid-steer loader. Because it's small, they gave it the name "Bobcat". They also produce compact track loaders and mini track loaders, but wheeled skid-steer loaders became very popular. Ironically, the first dozers and loaders were about the size of a Bobcat. They scaled up for highway construction during World War 2. Of course the compact ones from the 1920s were a lot smaller than the monsters of the steam era. Even in the 1960s they didn't have a safety cage, just a seat at the back. Today the brand name Bobcat has become synonymous with compact loaders like the brand name "Kleenex" with facial tissue or "Aspirin" for ASA. However, it is a brand name, other manufacturers don't use that name. Anyway, I suggest a compact track loader for Mars. Wheeled vehicles work better on hard ground, such as paved streets. But tracks work better on loose soil and for hill climbing. I agree that the tracked vehicles are probably more suitable for the Mars application, but they also need to increase the width of the tracks to handle the loose and sandy regolith we're anticipating. Having a look at the vehicle in your picture, I can also see that the operator could possibly work w/o having a space suit style helmet on while operating the unit. That would indeed be another "plus." Let us assume for the sake of argument that (1) somebody has developed an electric, tracked backhoe machine of fairly large size and lift capacity, (2) somebody has developed a concrete substitute that can poured into forms and cured at ambient Martian conditions, and (3) that glass or plexiglass panels usable for pressure window panes exist in some standardized form. Let us assume these things plus steel rebar are all shipped to Mars along with whatever else establishes the first permanently-occupied station. Then you can build shirt-sleeve buildings with bounced solar lighting during the day, that also provide radiation protection and great resistance to meteor hits, wind-blown debris, or bumbling humans. These are mushroom-shaped objects with a clear ring wall around the periphery under the cap. Simple polished aluminum or stainless sheets can bounce the light. These can be habitations or greenhouses. Or whatever you need. Dead weight contains the air pressure. We already know how to engineer slabs with grade beams, that's the roof panel, I just put the grade beams on top. The walls and columns are just compressive masonry. Bury with sand to cast the roof panel, then dig out when cured. Pile dirt on top, then pressurize when the caulk around the window panels has cured. I posted long ago how to do this over at "exrocketman". It was the article titled "Aboveground Mars Houses", dated 1-26-2013. This should be at least as easy as building a house here out of cinderblocks. That site is http://exrocketman.blogspot.com. There is a by date navigation tool on the left. Click on 2013, then on January. It's the first thing "up" in that month of that year. Key: you don't have to have a nearby hillside for this to work. You can build this on an excruciatingly-flat plain if need be. In other words, you can build it anywhere, there are no site restrictions. We need the concrete and the electric Bobcat, plus a big lander to bring them and the rebar down. None of this presumes any ISRU beyond using local dirt and rocks, and ice for the water. Nor does it presume any ISPP. But your job gets easier if those things actually work as advertised. Point is, it works anyway, even if those ISRU and ISPP things don't. And they might not! You MUST allow for that! Suspenders-and-belt, armored codpiece. That's the ticket! We have talked about altering the existing vehicles to make them lighter but leaving a place for regolith to be used for natural weight to allow for them to be able to have the traction required to move materials around the surface. The issue is just how big can we make the greenhouse as its a one shot deal with the materials that we bring. The other is what will grow quick enough so as to make efficient use of all that extra area that we have constructed. In the other topics we talked about preloading a site with materials and food so while not include the mars regolith moving equipment as well. Design the equipment to fit within what we can deliver now to mars surface but hope for the next cycle to improve on that capability and so on until we get to the magical block number that we wanted to send chunks in. I have argued before that life support must be robust. This is a planet without breathable atmosphere, so life support redundancy is critical. An ambient light greenhouse is the only life support system that works during complete power failure. And the surface of Mars has half the radiation of ISS, and plants are more robust vs radiation than humans. All this means you do *NOT* bury a greenhouse underground. No mushroom head, or anything else. Living quarters for a science mission will be a tuna can with sandbags on the roof. Living quarters for a permanent hab will have much more regolith, at least 2.4 metre depth. One purpose for building into a hillside is you don't have to lift the regolith; just push down from the hill onto the pressure roof. The Mars Homestead Project came up with an atrium built into the hill, with Sun-tracking solar collector reflecting light into a light pipe. That light pipe ended with a diffuser in the ceiling of the atrium. That brings natural light inside, but it's way to little light for agriculture. The plan was some plants in the atrium, including some fruit trees, but don't expect the trees to produce a lot. Indoor plants are for aesthetics. Wind-blown debris is not much. Mars atmosphere is very low density, it can't carry much. But I've posted before the hardness of minerals found on Mars vs glass. Tempered glass is all you need to ensure dust storms do not cause any crazing. Vehicles? Robert Zubrin argued for methane/LOX engine vehicles, so it can use the same fuel as the ERV. The ISPP facility for the ERV can be used to produce vehicle fuel once ERV tanks are full. However, if you want an all-electric vehicle, this guy converted a Bobcat to full electric. Click image for YouTube video. Two videos, same guys. 72-volt AC motor, lithium-ion batteries. Don't bring rebar from Earth. Use all in-situ resources for construction. Hematite concretions are perfect iron ore, can be smelted with the direct reduced iron method. That method requires both carbon monoxide (CO) and hydrogen (H2), between 800°C and 1200°C and 1 atmosphere pressure. We could go over all the steps to make rebar, but the point is ISRU. Concrete is very useful. Getting it to set in Mars atmosphere is an issue. That needs to be worked out. What was the operating time of these Bobcats operating with Lithium Ion batteries? Any idea of the charging time? If it could operate at full load for > 1 hour, that would be useful, especially if the recharge time were short. I have an E-Go battery powered lawnmower which can run at full load for nearly an hour with a recharge time of ~ 30 minutes, so it is actually a useful tool. I also have a Ryobi weed trimmer with decent operation time between recharges. Maybe the new Graphene batteries will do better? Agreed that its a step in the right direction for battery powered mars regolith movers as you say with your question the videos really did not answer the question of power consumed and recharge rate time as these are critical. I would look at the all electric Volt car as it would be of a simular design for battery use and recharge just compensate for the size of the battery bank as compared to what the bobcat has in it. 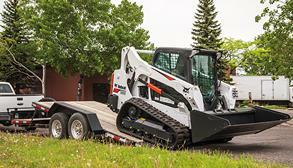 Something that would be added to the bobcat would be a seperate battery pack for life support functions. Tyres or tracks will wear very fast on regolith and rocks. I think we can solve the problem of keeping them warm enough by filling them with water with dissolved radioisotopes. Water filled tyres are used on earth for additional weight or traction. We still will need spares and maybe means to retread used ones. If our bobcat is to be made from light alloys and composites it will need all the added weight it can get on the Martian surface. One technique heavy cranes use is a stack of weights to counter their load. A crane can use a stack of metal plates, or a box of rocks. Some have pointed out a loader needs weight to counter its load. We can use the same technique: use light alloys, and a box in the back to hold Mars rocks. So relatively light for transport from Earth. From my Army days in Germany, nearly a lifetime ago; tracked vehicles are EXTREMELY maintenance consumptive. It generally took 10-15 man hours of maintenance for a single day of operation of an M 60 tank, or armored personnel carrier. This is one reason the British Army had an emphasis on wheeled vehicles BITD. Even the USMC bought into this idea with their 8 wheeled armored combat vehicles. Not that we're going to war with the Martians, but the elements on the Red Planet can be pretty darned aggressive at screwing up the tracked Bobcat. I'd suggest we have one of each--tracked and wheeled. Make a S by S comparison w/r to getting stuck and load carrying capacities. We'll need the redundancy anyway. They will need to be able to be refitted as backhoes, towing vehicles, cranes and forklifts as one machine will have to perform as many functions as possible. I'm pretty sure that you won't get two of these machines shipped at the same conjunction. Even made from light alloy and composites they are going to mass at least 5 or 600 kg. So the problem that we are still having is what size mass chunk are we going to be able to start the mars missions with and the desinging the payloads to fit that requirement. We will not be using such cargo for a demonstrator of adept or any other untried landing design and probably not even with a larger version of the skycrane but that is at least proven. Stuff like the Bobcat, Back hoe ect could be delivered I think in a modified payload shroud as we will need to be able to exit the landing directly from the landing platform. Since we are talking battery powered we will need the ability to connect to a charging base almost imediately as the batteries would probably power the landing to save on mass of the lander. I believe that the Bobcat style vehicles also have a digging attachment available, but sooner than later, we'll need to include a dedicated backhoe in the equipment package for transport to Mars. This brings up a topic of electric power generation, and the only way to achieve sufficient available amperage for recharging big Lithium ion batteries is Nuclear. My emphasis would be Thorium based power generation; that's just an aside and I don't want this thread sidetracked as a result. I agree, Oldfart. We are looking at a big power consumer. It won't be enough to operate it for just a couple of hours every two or three days. It would be possible to have a chemically fuelled unit, but that would mean enlarging the ISRU fuel/oxidiser plant which also requires large electrical supplies. I believe that energy consumption is going to be massive, if we are to accomplish ANYTHING! There are many here who hate the word "Nuclear," but if I were the big honcho running things, development of a clean and safe critical mass nuclear reactor would be at the absolute TOP of my list of things to accomplish before the first manned expedition. Without power, no Moxie unit(s) and certainly no ISRU for fuel to get home. Much less digging in for protection from GCR and solar flares, and nada for agriculture or running a rover. 1. If your settlers are going to rely on ISRU agriculture for food, then it needs to be absolutely dependable. That is why I think the first agricultural facilities or habs will be enclosed and reliant on artificial lighting. Natural light farming can only take place when we have built up sufficient stored food supplies to see the colony through a dust storm or meteorite strike. 2. I think there will be a natural progression over 10 years or so from reliance on food imports from Earth to potentially full food independence (I say potentially because I think there will still be substantial food imports of treats, prepared meals and meat - perhaps making up 10% of food intake). Initially, as in the Antarctic Bases, the emphasis will be on producing salad vegetables - lettuces and so on. It can only get better over time. Excellent points, louis. I'd like to expand on number 2. I expect that within the first couple Mars expeditions, we will grow some low energy intensity foods like lettuce and herbs, mostly for the psychological and digestive benefit. These could easily be grown in artificial lighting, the Mars-Lunar greenhouse was able to grow a whopping 54 grams of lettuce per kWh. But to grow foods with lots of calories will require natural lighting. I think the next stage will probably be thin film naturally lit greenhouses shipped from Earth. It may be hard to make them much lighter than the food they are replacing though, so they may be economical for some foods but not for others. In particular, foods with high fat content may be easier to bring from Earth since fat contains so much more energy per mass (9 kcal/g vs 4 for carbs/protein). The final step, which I think will take about 10 years, is making greenhouses from in situ resources. I agree with RobertDyck's assertion that glass will be used in the first ISRU greenhouses on Mars. There is just no other material with the UV and temperature tolerances needed that is simple to produce. Once these greenhouses are in place all foods except the exceptions you mentioned will probably be grown locally. I do believe that the first foods grown may not even be in a prepare greenhouse and that its going to use what ever it can especially on the first mission. When humans made the transition from the nomadic life of the hunter-gather to become inhabitants of communities, they did so by means of cultivating plants and domesticating animals. Soon, agriculture was born. Armed with the ability to stay in one place - humans now had the time and luxury to accumulate things - with knowledge being the foremost. At some point "civilization" emerged as a result. As human communities spread out across our planet, these two learned behaviors have become ever more pliant, allowing previously uninhabitable regions to become habitable. Each new challenge spurred the development of new solutions. We will addapt and create the solution once there even if we supply lots of stuff to make use of. There is also another factor to consider in the design and operation of a greenhouse on Mars: the human factor. 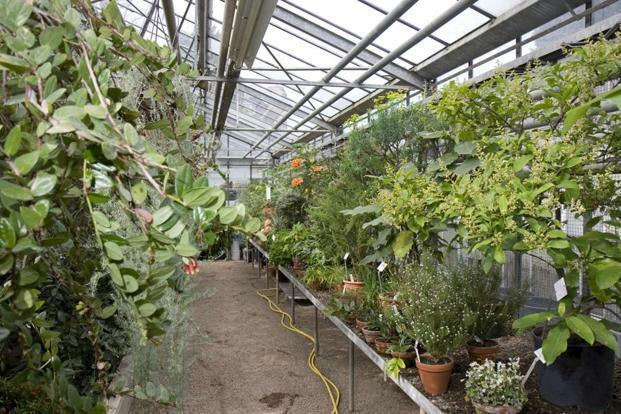 One of the earliest uses of greenhouses on Earth was for purely psychological reasons. In addition to the refreshing novelty of eating summer foods in the depths of winter, having sunlight - and warm air touching your skin can be very therapeutic. At McMurdo Base in Antarctica, crews "over winter " and are left without fresh food supplies for 6 months at a time. A greenhouse (actually light-equipped growth chamber) is in operation at the base which, at its peak productivity, is able to provide everyone with fresh salads twice per week. However, there is another benefit to this greenhouse. People are regularly found sleeping in hammocks strung between rows of racks growing lettuce. All of which will need to be grown in a controlled -- and preferably -- automated way. The trick then, for farming on Mars, is to produce enough food for a thriving settlement, with enough variety to keep us from going crazy -- all while maintaining a healthy dietary balance. To put it another way, we need a mix of vegetables, starches, proteins, fats and fiber to maintain our health -- and our sanity. Yes, I looked that up - 54 grams of lettuce is about 8 calories. As you suggest, it makes sense that we move into natural light farming as soon as feasible, as we try to grow crops that are more energy intensive. Another yes - I have always favoured shipping in high calorie oils and fats from Earth in the early stages. Very efficient way of transporting food. Choc bars are pretty good as well! I agree about glass being the obvious material, certainly in the first instance. I would also imagine the internal environment will be high CO2 but low pressure...enough for settlers to tolerate with breathing apparatus on. A lot of the growing process could probably be robotised. growing trays could be automatically accessed and robots could bring them to a human-friendly facility. Robots with cameras could send info on plant growth to the settlers. Yes, SpaceNut, I could imagine that transparent inflatables could prove v. successful as a bridge from imported artificially lit agriculture to fully natural light farming in Mars ISRU units. Importing such inflatables could definitely make a lot of sense in the first few years.